Three small twist bits. The largest of the three, which only has one twist, has a "0" on its back block. It appears to have a white material residue within its twist. The second bit, which has multiple twists, has the number "5/32" on it. The third, which is also a single twist bit has a maker's mark of an S, within a diamond, with the number 4 next to it, on its back block. 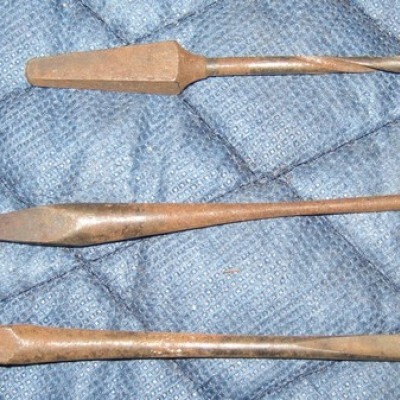 all three bits are fairly rusted.